Measurements: 2.75 x 4.7 inches; or 70 x 120 millimeters. Back of card: Brickwork from a gray stone wall with the words, "Lord of the Rings" top & bottom. In the center, two gold rings. So you can invert these cards. The deck includes a booklet 43 pages, 2.65 x 4.55 inches, or 67 x 116 mm. Game rules by Mike Fitzgerald. Comments: This looks more like a child's card game than a serious tarot deck. If you think so, too, then this is another case of Tolkien's epic overwhelming efforts at reduction. The Lord of the Rings has inspired movies, TV shows, plays & radio dramas, most of which have been flops. One of the better ones: A 26 part (or 52, we forget which) BBC radio adaptation from 1981. Its only serious flaw was a poorly cast Gandalf. As the weeks went by, the voice grated more & more. Like the shorter - and funnier - Hitchhiker's Guide to the Galaxy, you might find this on public radio from time to time. If this is the first time you've heard of the BBC Radiophonic production, call up your public radio station & ask them to run it. Promise them a check for support - it's only polite. 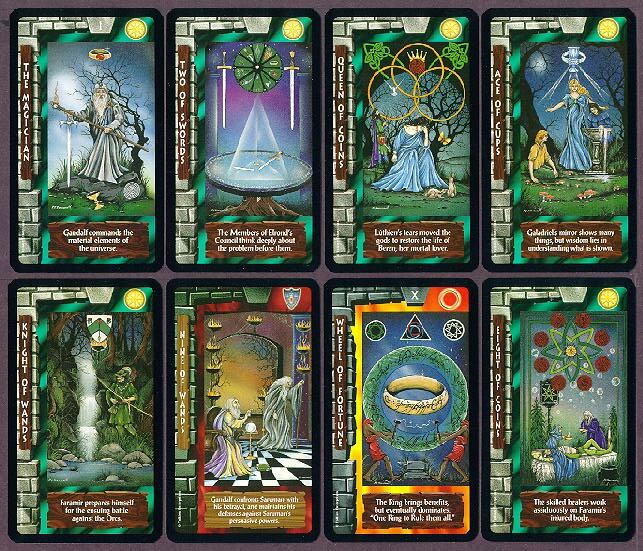 So in this deck, each card does triple duty: As a tarot card, as part of the story, and as part of an idiotic game. Face cards are King, Queen, Knight & Page. Suits are Swords, Wands, Cups & Coins. The cards themselves are dark, the figures small & remote. It's hard to tell what a card means without looking closely, or reading the cheat sheet on the bottom. And when you do, you get some fragment the Ring story which has little if anything to do with the card's tarot value. Fans of The Ring will find these cards fascinating. We confess we never did read the massive epic, so our focus is more narrowly on the cards as tarot. Clearly, a lot of work went into this deck, it repays close study.